The American Mustache Institute–a group which had previously lavished rapturous praise on the former Godfather’s Pizza CEO–announced it was rescinding its official endorsement of the GOP field’s only mustachioed candidate. In withdrawing its endorsement, the group cited recent allegations made against Cain, including their own tongue-in-cheek accusations: That the advertising at Godfather’s Pizza was misleading and that his mustache could be a fake. It seems now Cain’s mustache is real. At least the American voter can know for certain whatever promises he might be dishing out above the torrent of words straddles his mustache like a bridge. He may want to follow the career of yesteryear comic book hero Mandrake the magician and make problems disappear with wave of his hands. I wonder if Herman has his Lothar at hand each time he gropes for words. Every American female voter he shall woo as though she were Nancy. Oops I meant Nadia. According to a biographer, “Danton’s height was colossal, his make athletic, his features strongly marked, coarse, and displeasing; his voice shook the domes of the halls” The pen portrait is drawn after a painting by Mlle. Charpentier. Danton studied law and became a lawyer in Paris. Danton’s first appearance in the Revolution was as president of the Cordeliers club, whose name derived from the former convent of the Order of Cordeliers, where it met. One of many clubs important in the early phases of the Revolution, his gift of oratory coupled with commanding presence brought him attention. The Cordeliers was a centre for the “popular principle”, that France was to be a country of its people under popular sovereignty. It was here he came into contact with Marat, Camille Desmoulins. This group believed in popular sovereignty and the need for a radical action to dramatically change the face of the French society. Danton was a very good orator and this ability allowed him to become more and more famous within the people of Paris. In June 1791, the King and Queen made a disastrous attempt in what is now known as the Varennes escape. They fled from the capital. They were forced to return to the Tuileries Palace and were held as prisoners. This precipitated the popular reaction to think on abolishing the monarchy altogether or for a constitutional monarchy. Lafayette of the American war of Independence fame belonged to the latter group but the massacre of the Champ de Mars (July 1791) resulting in an effort to put down the insurrection killed whatever chance this party had. Danton fearing counter-revolutionary backlash, fled to England for the rest of the summer. Back in Paris in November, he was elected “Procureur de la communes de Paris“. The National Constituent Assembly completed its work in September 1791.On July 31st, 1791 he was elected administrator of the “departement” of Paris. In April 1792, the Girondist government—still functioning as a constitutional monarchy—declared war against Austria. A country in turmoil from the immense civil and political changes of the past two years now faced war with an enemy on its eastern frontier. Parisian distrust for the court turned to open insurrection. On 10 August 1792, the popular forces marched on the Tuileries; the king and queen took refuge with the Legislative Assembly. Danton became minister of justice, which was a reflection of his growing status within the insurrectionary party. On September 2nd, 1792 France was close to an Austrian invasion and Danton asked for “De l’audace, encore de l’audace, toujours de l’audace” (“We need audacity, and yet more audacity, and always audacity!”). By 1792 he was at the height of his powers. He was elected Deputy of Paris on September 5th, 1792. He resigned from his deputy role and joined the Convention, side by side with Marat, Robespierre and Camille Desmoulins. 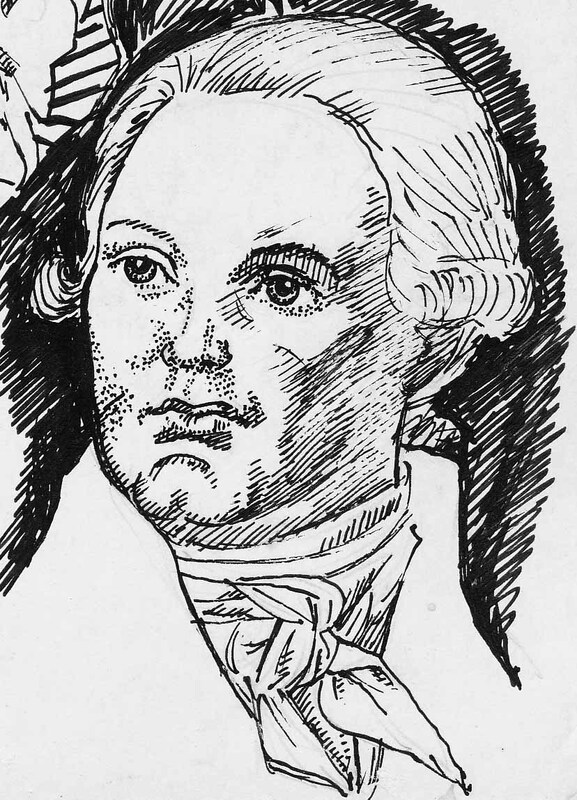 He was quickly opposed to Robespierre who he saw as a competitor within the group. Danton voted for the execution of Louis XVI and participated in the creation of a revolutionary’s court in March 1793. He became president of this court. He entered the “Comite de Salut public” in April 1793. He voted for the exclusion of the Girondist group, which he considered a obstacle to the development of the Convention. His downfall came in the ensuing conflict of ideology in the direction of the revolution should take. He was accused of being too soft by counter revolutionaries. The austere and inflexible Robespierre feared his rabble rousing skills. He was fired from the “Comite de Salut public” and Robespierre took his position. In August 1793, he supported the “sans culottes” and the Terror. In November, he lost power within the “Cordeliers” group. Danton did not seem to take heed and secure his safety while Robespierre and his cohorts were maneuvering his downfall. On March 30th, 1794 Danton was arrested with Desmoulins. He was accused by the revolutionaries court of being an enemy of the Republique. He was condemned and killed on April 5th, 1794. His last words were: “Do not forget to show my head to the people, it is well worth seeing”.